After finding out that my grandma's Uncle Ernest had been married twice, and possibly lost contact with his daughter, I decided to move on and look again at his sister, Emily Jane Field. I'd been unable to trace her beyond the 1911 Census, when she was a servant working in Lewisham, but a vital clue appeared in a letter written by her mother (my gt-gt-grandmother), Sarah Field, on Armistice Day, 1918. "There is some very sad hearts to day for them that will never return i have thought about poor Emily i do wish poor Tom had been spared to come home to her." So had Emily married a man called Thomas? Or was he her fiancé? I could find no marriages for an Emily J Field to a Thomas, except for one in Bristol, which didn't appear to be her. There was an Emily Field, without the J, who had married a Thomas J Mowforth in 1912, but was that her? I tried searching on the 1939 Register using Emily's first name and exact date of birth and came up with a long list of women called Emily. There was only one Emily J on the register with her birth date – Emily J Hearne. And when I read Ernest's will, he mentioned his sister, with that exact name. But I could find no Field/Hearne marriages which matched up. If the Tom in the letter had been her first husband, then could she have married again? But how could I find out? The obvious step was to have a good look at the 1939 Register entry. Emily J Hearne was living in Peckham. A widow, she was living in a flat in Peckham with two other people. One record was closed, but the other was that of John L Hearne, a butcher's assistant, born in 1921. I looked him up in the BMD index and saw that his mother's maiden name was Field. This induced a cheesy air-punch moment from yours truly, and I sent off for his birth certificate. I had to wait a week for it to arrive, and when I came home from work and found the envelope on the mat, I opened it before I'd even taken my coat off. The birth certificate told me that John was the son of John Thomas Hearne and his wife Emily Jane, late Mowforth, formerly Field. So the Mowforth marriage had been Emily's all along! But just to make sure, I sent off for two marriages certificates. John Thomas Hearne, bachelor, marrying Emily Jane Mowforth, widow, in Hammersmith, London, in 1920. And eight years earlier, in 1912, Thomas J Mowforth had married Emily Field. Whilst the bride was missing her middle name, there was a match with her age and her father's name and occupation. So this was definitely her. I found out that Thomas and Emily had had one child, a daughter born only a few months after their wedding. Thomas had been a widow when he married Emily, and when I found him on the 1911 census, he was living with his three children by his first wife, and also with his brother. 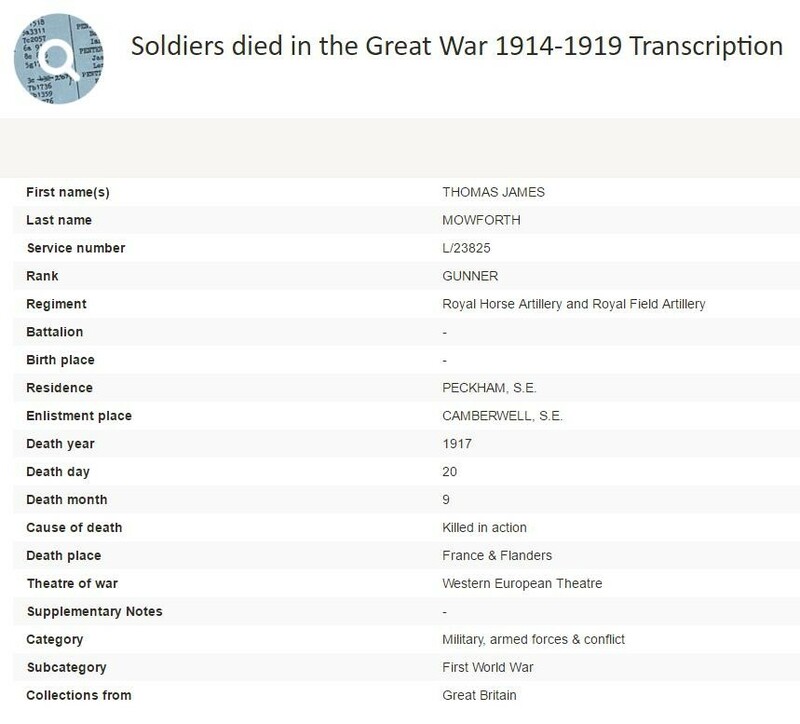 I was fairly sure that Thomas Mowforth had to be the 'poor Tom' from Sarah's letter, so I looked at Findmypast's World War 1 records. Although I knew what I'd find out, nothing quite prepares you for seeing it written in black and white. There he was, Thomas James Mowforth, in the 'Soldiers Died in the Great War 1914-1919' record set. It gave his regiment – Royal Horse Artillery and Royal Field Artillery – and that his death, on 20th September 1917, had taken place in France and Flanders. His residence had been Peckham – where Emily would still be living come the start of another war. Curious to see what other information there might be, I looked him up on Google. He wasn't difficult to find – a photograph of Gunner Mowforth's grave in the Poperinge cemetery, just outside Ypres/Leper, is on the Find a Grave website. At this point, the lump in my throat, which had developed on seeing 'poor Tom' in the record set, turned into tears. The logical side of my brain, which had led me to this point, was pushed aside by sadness for Emily, and all four of Tom's children. In fact, even writing this now, the tears come back again. I realised that I had visited the cemetery where Tom was buried on a school trip when I was 15, and I hadn't known at the time that I was also visiting my grandma's uncle. As I looked at the photograph of the clean, white headstone, with its lettering that has softened and blurred with the passing years, I wondered if Emily herself had ever ventured over the Channel to see where her husband lay. But life went on as it did for the many, many bereaved – Emily had married again and had two more children, and lived into her 70s. Sarah Field, who had sat down on Armistice Day 1918 to write a letter scattered with clues for me to find nearly one hundred years later, died in 1919. It's astonishing to think what she had lived through – two of her sons had gone to fight, and although both came home again, one of them had been wounded, and she had lost a son-in-law. Sarah lived in Brightlingsea in Essex, a small town which sits on the North Sea coast, at the head of the River Colne. Many of the locals were mariners – her husband worked alternately as a yachtsman and a fisherman – and as I cast my own net wider and started to look at other members of Sarah's family, another story of tragedy and survival against the odds came to light. Exactly a week after Tom and Emily's wedding in 1912, the Titanic hit an iceberg. On board was Emily's cousin, Charles Savage, and his brother-in-law Sidney Siebert. They worked as stewards, and now these two experienced mariners leapt from the sinking ship into the icy water. But only one of them would make it back home to Brightlingsea. What happened next? You'll have to wait for my next instalment.